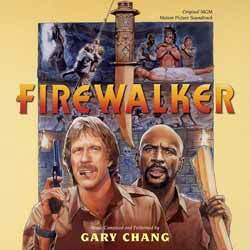 This is the first time Gary Chang's electronic score for 1986's Firewalker has been released on CD... (it had a limited edition vinyl release back in the '80s) but you'd better get your skates on as only 1000 copies have been pressed. On the first play through of this 11 track score (42 min, 31 sec), I really didn't enjoy it. It was too dated, too twee and too bland. It took me a further three listens to even begin to appreciate how fine an album this is. If you fondly remember the film, then you might be surprised at how well the score has held up. Yes, it's a product of its synth-based time, but Chang really does deliver some intricate themes. If you're a fan of '80s synth-based scores then this is an essential purchase for your music library. Likewise, soundtrack collectors would be foolish to let this one pass them by.